Welcome to Tonight’s Dinner. On the menu we have Rice Pilaf served with Fried Chicken. This is one of my many favorite meals. The plight of a foodie. lol. So many great delicious meals out there. 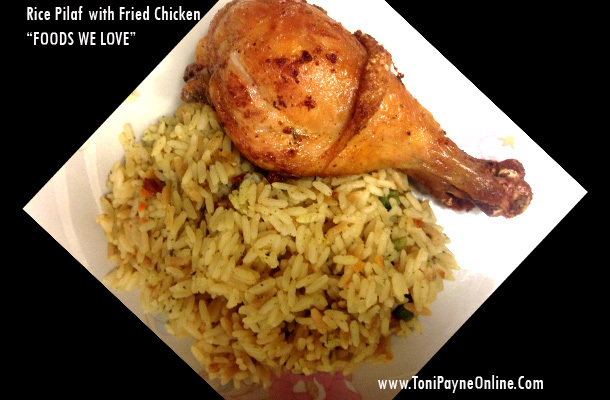 Normally when I make rice pilaf, I serve it with oven roasted chicken. This time I did Fried Chicken, well because I had a craving for something fried. I will share my simple recipe for the fried chicken below. If you wish to know how to make the rice pilaf, let me know and I will put one together. Now, the key to the savory awesome taste of my Fried chicken is that I season it overnight. I feel and know it allows for the seasoning to get into the chicken giving it a delicious finish. Anyhoo, check out my simple fried chicken recipe below. Besides seasoning overnight which you do not have to, it takes less than 30 minutes to make. Told you it was quite simple. If you have any questions do let me know. If you love any of my recipes or foods we love, kindly feel free to share. Till next time, enjoy! So do you have a Chicken Recipe you want me to try? Do comment below. You need to use a heart charge monjtor to calculate your calorie expenditure or cellular-integrated GPS trackers.